> Knowledge base> Article: My Bravo 4100 Series printhead / cartridge is defective. What can I do? See this article to view the troubleshooting you will be asked to perform. To receive replacements, you may be required to send your defective cartridges/Printhead for analysis. Tech Support will not replace cartridges with less than 50% ink remaining or if you print head show 0% life remaining. The estimated printhead life is approximately 26 black or 32 (of any) color cartridge changes whichever comes first. This is not a guarantee of printhead life. The printhead could last longer or shorter than this depending on many environmental and use factors. Print head life is displayed in PTPublisher. 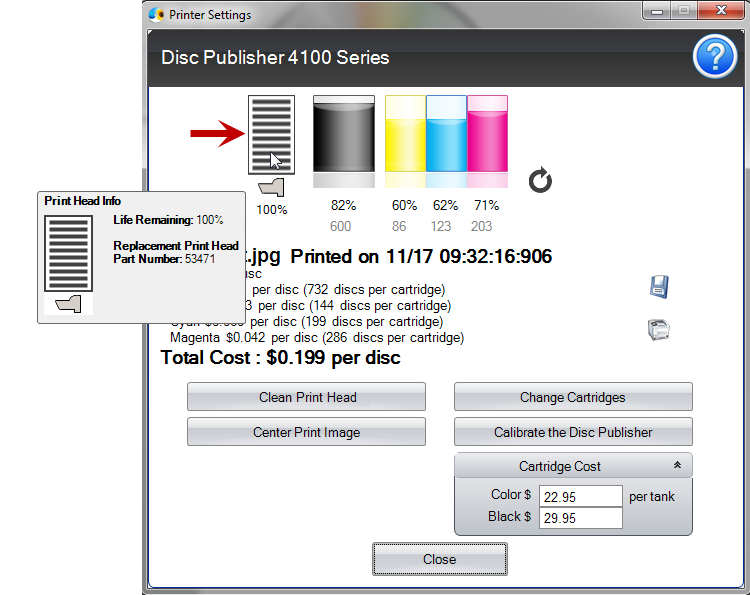 Double click on the Ink icon in the lower right corner of PTPublisher to view the print head life as a percentage. Printheads with 0% life remaining (over 26(32) cartridge changes) will not be replaced for free under any circumstances. Printheads with 1% or more life remaining may be replaced depending on the description and circumstances of the failure at the discretion of Primera Tech Support.